Filled with 12 oz. of American Soybean WaxTM. Measures 4"W x 5.25"H with a 75+ hour burn time. Filled with 12 oz. of American Soybean WaxTM. Measures 4"W x 5.25"H with a 75+ hour burn time. 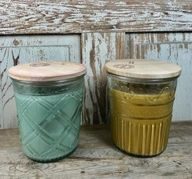 Please note these jars are sold individually and the picture is simply for display purposes. Filled with 28 oz. of American Soybean WaxTM. Measures 5.5"W x 6.25"H with a 75+ hour burn time Please note these jars are sold individually and the picture is simply for display purposes. Filled with 13 oz. of American Soybean WaxTM. Measures 5.5"W x 3.25"H with a 35+ hour burn time. Filled with 3 oz. of American Soybean WaxTM. Measures 2.5"W x 3.0"H with a 20+ hour burn time.Please note the picture is for illustration only to show the different styles, jars are sold individually and not as a 3 pack. Jar style is assorted. 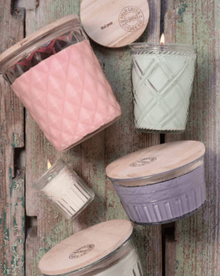 Try out different fragrances with this set of 3 Mini Timeless Jars!Filled with 3 oz. of American Soybean WaxTM. Measures 2.5"W x 3.0"H with a 20+ hour burn time.